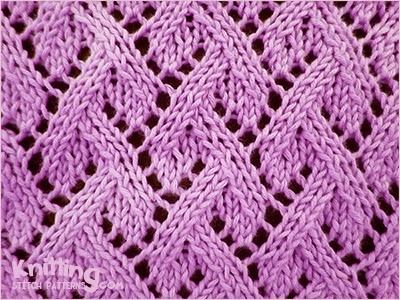 Note: There is 1 decreased stitch per repeat in Rows 2 and 8 which are then added back in Rows 6 and 12. Knitted in a multiple of 8, + 3 sts and 12-row repeat. Row 1 and all wrong side rows: Pur all sts. Row 2 - right side: K1, * k2tog, k1, yo, k1, ssk, k2; rep from * to the last 2 sts, k2. Row 4: * K2tog, k1, (yo, k1) twice, ssk; rep from * to last 3 sts, k3. Row 6: K2, * yo, k3, yo, k1, ssk, k1; rep from * to last st, k1. Row 8: K4, * k2tog, k1, yo, k1, ssk, k2; rep from * to the last 7 sts, k2tog, k1, yo, k1, ssk, k1. Row 10: K3, * k2tog, k1, (yo, k1) twice, ssk; rep from * to the end. Row 12: K2, * k2tog, k1, yo, k3, yo, k1; rep from * to the last st, k1.